My adorable little nephew is healthy and growing. He is so much more alert and moving more than he was when he was first born. He is just adorable. Tomorrow, he will be two weeks old! :) My sister says that he is her "Ry Guy" and I think thats pretty cute. He is such a lover... and he seems so tiny! My sister is doing great, too! She is a total trooper. I know she really appreciates all of the support from our sweet family and friends. We are so lucky! 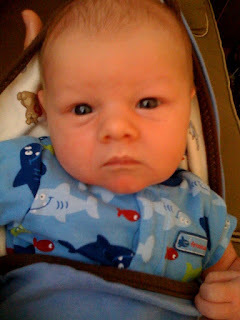 wait until he is 6 weeks, then they get really fun because they start smiling, laughing and becoming more interactive. He is so cute! I'm not a huge kid person, but when my sister had kids it introduced me to a type of love I never knew existed. What an exciting time for your family - congrats! Oh my gosh, trac! He's DARLING!! And looks so much like you Zehnders!!!! Keep the pics and updates comming!! Peaches, your little guy is so so cute! Mom and Dad must be so proud to be grandparents! Big hug, hope to see you when I'm down visiting E.
OMG! He is ADORABLE !!! He has the face of an ANGEL, what a WONDERFUL BLESSING!! !